The aim of this contribution is to establish a comparison between the results of the study of the oldest manuscripts of the Koran currently known and available, and at the other hand the suspected manipulations of the text based on a cross examination of ideological and exegetical data. This comparison is illustrated in the table-chart below. We will of course develop only a few examples in the present article. The five manuscripts at hand, however incomplete, are the following: the Paris BNF ar.328a 1, the British Or.2165 (provided with diacritical dotting), the Samarkand manuscript, the palimpsest of Șan‘ā’ (available through a series of pictures and articles from Gerd and Elisabeth Puin); and, finally, the manuscript of St Petersburg (which is later and diacritically dotted). Presuming that some of the microfilmed manuscripts from the years 1930s of Anton Spitaler 2 are really ancient, we keenly should add them to the table, but they remained removed them from research (the follower did not publish them until now)3. To the left of the columns relating to the five manuscripts (i.e. in the left column of the table) is a non-exhaustive list of 46 verses suspected to have undergone a manipulation that is not purely formal or accidental, as would for instance an error from a copyist, but an intentional one involving at least two words. That typically fits the format of an interpolation. Obviously the intentional withdrawal of words is, by nature, much more difficult to see. As far as the fixation of diacritical marks or of later vowel glyphs is concerned, intentional shifts may certainly have induced some distortions of meaning 4. This, however, does not fit into our purpose of comparisons that relate to the rasm i.e. the “consonantal skeleton”, according to an expression of David S. Powers. Concretely, we started from previous studies 5 including different analyses of 35 of the 46 suspicious verses at issue here; other research have provided us with additional conclusions as to the 7 other verses (E. Puin, M. Lamsiah, D. Powers), which is not much, we have to admit, compared to the number of studies currently available that evoke substantial manipulations of Koranic verses. The table below is only a first step. The present work is less about “proving” something than about showing existing connections between the data found by applying the proper exegetical methods in the study of these manuscripts and, on the other hand, a peculiar historical and ideological context which enlightens the question “why” (especially: why this or that manipulation?). It turns out that these connections are fruitful in two ways: they shed some light onto both the history of the text and the validity of the ideological context under consideration. Of the aforementioned manuscripts, only one seems to predate the reign of ‘Abd al-Malik (685-705), at least as far as the level of its stratum of palimpsest is concerned: that of Șan‘ā’. Carbon 14 dating of one of its sheets indicates a date prior to 655, while others give variant results. One can question the validity of that method when it is applied to parchments 6. Anyway, the analysis of variants which we shall look into further suggests a first writing or scriptio inferior going back to the second half of the 7th century. “The sources report that a systematic campaign to destroy nonconforming Qur’ân codices was carried out on two separate occasions, first during the caliphate of ‘Uthmân and again during that of ‘Abd al-Malik; and that in 45/665, the șuḥuf or sheets collected by Zayd b. Thâbit for Abû Bakr were destroyed by the governor of Medina. To the best of my knowledge, the only scholars who have paid serious attention to the redactional activity sponsored by ‘Abd al-Malik are A.-L. de Prémare and C. Robinson” 7. Of course, we do not expect to find in the old manuscripts in existence today a text really anterior to the time of these official revisions. And even if some ideologically divergent verses had survived that time, it is most certain that the folios which contained these verses would have carefully been removed from the manuscripts. Now, what we actually find in these manuscripts is that the folios expected to contain the 42 questionable verses often seem to be missing. Of course, one could explain this fact by alleging coincidental occurrences. However, the fact does remain highly surprising, as evidenced by the table. This presentation will limit itself to simply review a couple of examples. To begin with, let us say a word about the color-coding used below. The white boxes indicate the absence of a given folio and often provide extra indications as to when the next Folio begins or which is the last. The green boxes stress that the verse exists with its rasm as it is today. The orange boxes draw attention to the visibility of the addition. Finally, the light green boxes highlight the visibility of missing words. *: Q.57:27 shows a long anachronistic digression on the Christian monasticism [rahbānīyah] (Blachère). **: addings that Prof. Manfred Kropp and Guillaume Dye recently highlighted: Q.15:26-27; Q.109:1 [qul yā-ayyuhā l-kāfirūn – an hypothetical adding]; Q.19:34-40 [a polemical interpolation into the strict structure of Aramaic soghita]. The first column to the left lists the verses which together raise questions from the perspective of historical-ideological analysis and exegesis. The preferred framework for the development of the historical-ideological analysis emerged as early as during the first Germanic islamological studies but did not take shape before the mid-70s, in a mostly French-Middle-Eastern 8 milieu: this line of research is what is known as the “Nazarene” research, sometimes also known through Patristic writings as “Ebionite” 9; as for us, we shall use the term “Judeo-Nazarene” to avoid any confusion 10. Looking into the four major manuscripts, the folios where these verses actually occur are few (they are missing as much as 65% of the existing data). But the most surprising finding yet is the implication that Christians ever called themselves “Nazarenes”. The indeniable truth is that the Christians were never called by that name, whether in the West or in the East. All these allegations are quite suspicious, to say the least. There are more surprises still. The Koran presents four other occurrences of “Nașārā” – Q 2:62; 5:69, 5:82, 22:17 – that translators often render by “Nazarenes” (including the Saudi translators of IFTA), that is to say where the co-text rules out the possibility that the word may have the sense of “Christians”. But in the 10 already mentioned occurrences, the same word of “Nașārā” unambiguously is meaning “Christians”. Why is it so? The same pattern comes into play every time of theses 10: the term “Nașārā” appears right after that of “Yahûd” (or possibly “hûd”) designating the Judaic Jews: therefore the word can only mean “Christians”. Six out of these ten times, the word is found in a very short formulation: “and the Nașārā” or possibly “or Nașārā”; the other four times, the parallel between Yahûd and Nașārā is broader 11. Furthermore, with Sura 5, one has to reconcile a complete contradiction between the rejection of the “Nașārā” in verse 51 and the sort of friendship displayed towards them according to verse 82. Should we allege two kinds of “Nașārā”? Actually, a break in the rhythm betraying congruity with the formula “and the Nașārā” in verse 51 is perfectly detectable through chant (as Antoine Moussali, a leading specialist of Arabic, had showed as early as 1996). All exegetical clues put together contribute to show that these 10 short and long parallelisms “Nașārā” /Yahûd are artificial: passages comprising the word “Nașārā” should be removed. The results speak for themselves: the text becomes plain, coherent and clear. And we can see that those same passage speak only about the Yahûd. What then is the ideological significance of these interpolations? Why was it necessary to have introduced them into the Koranic text? Why was it so important that the term “Nașārā” be understood to refer to Christians, even at the risk of serious internal inconsistencies? To understand the stakes behind the question, we must follow the Judeo-Nazarene line of investigation, beginning from the years 639-640. In short, in this time-period took place the rupture of the Arab-Nazarene alliance, between the initiators of the proto-Islam (the Nazarenes themselves) and their Arab allies: this rupture proved decisive for the future. What happened is that the Arabs turned against the Nazarenes to assert their own sovereignty over the conquests and claim that they now formed the Ummah chosen by God to rule the whole world, that is to say the Arab Ummah 12. The idea then propounded by the Caliphs was to appeal to a new and explicit divine will – God coming to somehow endorse the newly established Arabic sovereignty spreading over a wide area of the Middle East. This transition from proto-Islam to current Islam was only made possible by carefully concealing the “Nazarene” connection. And, what better way to succeed than altering the very meaning of the word which originally designated it? The Nazarenes claimed to be the only true Jews and true Christians: that is probably what suggested the idea of mixing and diluting the sense of “Nazarenes” into that of “Christians” to incorporate this shift in meaning into the text of the reference book called “Koran”. 3. The Koranic Text: From What Origin to What Purpose? Very early indeed did the Caliphs need to produce a text they could oppose to the Book of the Jews and the Christians. What is it made of? Why is the Aramaic language so often surfacing (including even the words of “Qur’ân” 13 and “Sura” 14)? Why does its knowledge allow to correct diacritical errors of the Koranic text, as demonstrated by the work of Christoph Luxenberg (as well as for instance a study by Munther Younes on Sura 100 also showing that verse 3 probably is an interpolation 15)? What are these leaflets (or șuḥuf) that Islamic tradition claims to have gathered with great difficulty? Why were they devoid of any diacritical marks, while the habit of using such mark was widespread, as we know today 16? With respect to all these points, the Judeo-Nazarene line of research sheds significant light. If the leaflets of the original Koranic compendium together form a variety of Arabic memory-aids from Judeo-Nazarene masters, all four questions asked above at once receive their answer. Given that the mother tongue of those masters was Aramaic, not Arabic, when working on behalf of their Arab allies they would prepare their sermons in written form; and when jotting them down in writing for, obviously they would not have had time to care about diacritical marks. His or their authors knew what the memos actually meant. The period of the șuḥuf extends from the beginning of the 7th century until the entering into Jerusalem under ‘Umar’s rule. It ended with the strike of the Arab military leaders against their advisers called Nașārā (according to the four original Koranic mentions of the word). The sought objective was to justify the sovereignty acquired over a wide territory with the help of a Book saying in Arabic that it was God himself who decreed this vast Arab dominion. Being unable of themselves to produce such a text, the Arab circles revolving around the caliphs decided to use the Arabic memos left behind by the Nazarenes in various places: would it not be sufficient to choose among those scattered writings those which would fit best? However, deviating texts from their original meaning is does not go without quickly raising a handful of problems. This “redactional activity”, as Powers puts it, had to be carried over a long stretch of time (at least up to ‘Abd al-Malik included) in parallel to a very different activity consisting in the downright destruction of every diverging compendium or leaflets (an activity which went on even after ‘Abd al-Malik). Are we in possession of any significant data from the ancient manuscripts indicating this kind of historical and theological context, despite the absence of many Folios? The answer is yes, and lies around the matter how who or what inspired the Koranic texts? 4. The Koran, inspired? But How and By Whom? The study of the palimpsest of Șan‘â’ certifies that the article “al” was later dropped from the formula “ar-rūḥ al-qudus”. Let us note that such a manipulation is far from being neutral 17. In the standard text the expression “ar-rūḥ al-qudus” occurs four times, of which three possess an identical co-text regarding Jesus-‘Îsa, who is said to be assisted by God through His “rūḥ al-qudus”. “[The] rūḥ al-qudus has brought it down from your Lord with the truth, in order to strengthen those who believe, and as guidance and good news (bušra) for the muslims (those who submit)” (Q 16:102). “A man assuredly (innamâ) teaches him. The tongue of him they point to is foreign (a‘jamyy), while this is Arabic, pure and clear” (Q 16:103). The discussion therefore focuses upon the fact that the language of the teacher is not Arabic, and not upon the fact that the the teacher is an angel rather than a man: it is the false interpretation given to the adverb innamâ (only instead of indeed, as we will see further) that suggests that some would believe in the intervention of an angel, while others object that it is but only a man. What is for us of interest in verse 102 is its formula ar-rūḥ al-qudus: if it is to designate the angel Gabriel, we must accordingly delete the first article to prevent it from meaning “the Holy Spirit” and mean instead: “the spirit of the Holy one” – by which is meant “an angel of God”. This change is radical: it is linked to the idea that the angel Gabriel dictated the Koran to Muḥammad. It can also be dated: the idea in itself is posterior to AD 735, year around which John of Damascus simply wrote that Muḥammad received the Koran in his sleep. Arguably, then, the case can be made that the scriptio superior or the last text from the manuscript of Șan‘â’ (including its second scriptio inferior, namely the most recent) does postdate 735. 5. Deifying the Koran and/or the Rasûl? This question provides another instance of how crucial the task of comparing the ideological (or “theological”) analysis of the Koranic text with the codicological data in light of contributions of exegesis, truly is. The palimpsest of Șan‘â’ reveals yet another revision in two verses (89 and 101) 21 of Sura Al-Baqarah; here the revision (ideologically and historically much significant) does not consist in an expunction but rather in an addition. To understand, we must first point out that the term “min ‘inda Llâhi” carries more impact than “min Llâhi”, which simply means “of God” or “from God”. “Min ‘inda Llâhi” means “from before God” 22. It is found in the standard text but is missing in both scriptiones inferiores of the palimpsest, with the one exception of the latest scriptio inferior of verse 89. But what do these two verses speak about? In addressing people who do not believe, they respectively assert that a book or a messenger (rasûl) came from God. They are therefore, ideologically speaking, of much significance since, for the Muslim reader, the messenger can only be Muḥammad 23 and the book only the Koran. From the perspective of exegesis, there lies a major problem. The Koran does speak of messengers coming from God (min Llâhi), but never from before God (min ‘inda Llâhi) – with the exception of verse 101 of Sura 2 in the standard text. Such a term is used in connection to the rewards God offers 24; and, if a message put in writing is said to come from before God, it is only in a co-text recalling controversies with the Yahûd who produce writings other than the Bible’s while claiming that such come from before God: the Koranic text blames them for that (Q 2: 79; 3:78). The co-text of our two verses precisely reflects such a controversy; it mentions Moses, the golden calf, and a Mount (certainly Mount Sinai); it also targets the Yahûd by disparaging them as kâfirûn 25 (v.89) and as “people to whom the Book was given” (v.101). Why these attacks? “Come you with a book [coming] from before God that is a better guide than these two [the Torah and the Gospel]” (Q 28:49) 26. The Judeo-Nazarenes never said that the Gospel came “from before God”. Of course, they considered Moses to be the author of the Torah, but they knew that Jesus was not the author of the injîl-gospel, even if God taught it to him (according to the Sura the ‘Imrân’s Family, verses 48-49). However the co-text is one of polemic. The “Book” mentioned in verse 89 and, right before it, in verse 87, is nothing else than the Gospel “which came” to the Yahûd but which the Yahûd rejected. Similarly, the messenger of verse 101 is the-Messiah-Jesus who came to fulfill what is contained in the Book – namely the Bible. Never would have Judeo-Nazarene theology added that Jesus came “from before God”: this would have verged too close along the lines of the Christian faith. It is therefore in keeping with what is predictable that the formula min ‘inda Llâhi should not be found when we look into the ancient layers of these two verses. The story reads rather differently from the interpretation propounded by the Islamic doctrine that exalts the “rasûl Muḥammad”. First, it has got to imagine a heavenly Koran “before/with God”, as does Judaism with respect to the Torah. In verse 89, the Book “which came to them” can only be the Koran, and it must be clear that this Koran is from before God. This claim is stated as early as the period to which the second layer of the palimpsest dates. In other words, the addition of the formula min ‘inda Llâhi in verse 101 in the standard text bears witness to a time when the status of “the messenger-Muḥammad” was still undecided. What we have here is a significant clue providing us with insights into the ideological fumbling attempts that motivated the fabricators of the Islamic narrative during the second half of the 8th century (or even later). “Glory to Him who, one night, sent on to travel [with] his servant from the Sacred Mosque (masjid al-ḥarâm) to the al-aqșâ Mosque of which we have blessed the precincts, to show him some of our signs. He is the Hearing One, the Seeing One. Various questions arise as to 1) the unexpected length of verse 1; 2) its mention of the al-Aqșa Mosque in Jerusalem, which was not erected before ‘Abd al-Malik 28; 3) the identity of the “sacred Mosque”; and, finally, 4) the identity of the servant God sends on a ​​journey: is the latter really Muḥammad? Regarding the al-Aqșa Mosque, one can always say that God revealed to Muḥammad the name of the mosque which would later be raised and named al-Aqșa from the name He had given it, knowing it would be edified under the name he supposedly had given it – this does sound like circular thinking. “God made [of] the Ka‘ba, the Sacred House, a station for people (qiyâm, a place where people stand)” (Q 5:97). “Allah has made [of] the Ka‘ba a station for the people” (Q 5:97). In the same manner, couldn't we see an interpolation in a passage of Sura 17 verse 1 alluding to holy places of Islam? We besides are dealing here with a metrics problem: a rhyme in “an” runs throughout the whole Sura to mark out the end of each verse (including the caesura)... with the one exception of verse 1 which ends in îru. However, verse 1 does use that rhyme in “an” at the end of the word laïlan (at night) where from all appearances the verse should end. There is a third and last argument. In verse 1, the rasm can be read both in the singular bi ‘abdihi, with his servant, and in the plural, bi ‘ibādihi, with his servants – the alif (ā) being commonly known to be left out in the middle of the word. An example of the alif is also left out is in the word ar-raḥmān, which should be written , but is actually written . Here is another example: the rasm may be read in the plural (as ar-rīyah, ) as well as in the singular (the wind). It is under these two forms that “grammarians” from the Abbasid period read it in Q 18:45 29. Koran experts are aware of the ambiguous nature of the alif which, in its higher position, belongs to the set diacritical marks subsequently added. “And we inspired Moses: Journey with my servants (‘ibādiy)” (Q 20:77 || Q 26:52). Or yet again : “So journey with my servants (‘ibādiy) by night ; verily, ye will be pursued” (Q 44:23) 30. We need to look at the fabrication of the “Night Journey” in light of revision made to verse 1 of Sura 17, which was originally known as “The Sons of Israel”. What happened? Which came first, the story of the journey, the construction of the masjid al-Aqșa, or the interpolation of the beginning of Sura 17? We currently do not possess enough conclusive elements to decide. What is certain is the intention behind it: after the breakup with the Judeo-Nazarenes, the worship significance of Jerusalem could no longer be justified. What was needed was to establish it in a brand new way: this was the whole purpose for the new legend of Muḥammad’s isra’. It is clear, once again, that the ideological analysis only confirms the exegetical analysis and concurs with additional indications from codicological studies: the oldest of the five manuscripts, the Paris Arab 328a, curiously does not contain the folio for that verse. Next we will examine a number of problems raised by the Paris Arab 328a and which confirm the exegetical and ideological analysis presented in Le messie et son prophète regarding verse 171 of Sura 4 An Nisâ’. This will end our overview of the table this contribution draws from. Noticing that the back of Folio 20 contains 25 lines instead of the usual 22 or so, and most importantly considering that the first 6 are too wordy and too broad at the same time, David S. Powers concludes that the last verse of Sura 4, verse 176, was added at the time the copy of this manuscript was first made. How does he arrive at such a conclusion? It is because this legalistic verse has no connection whatsoever with what precedes. And, most significantly, because it introduces a new doctrine in matters of inheritance laws. Everything revolves around the word kalâlah which only appears here and previously in the same Sura (verse 12). 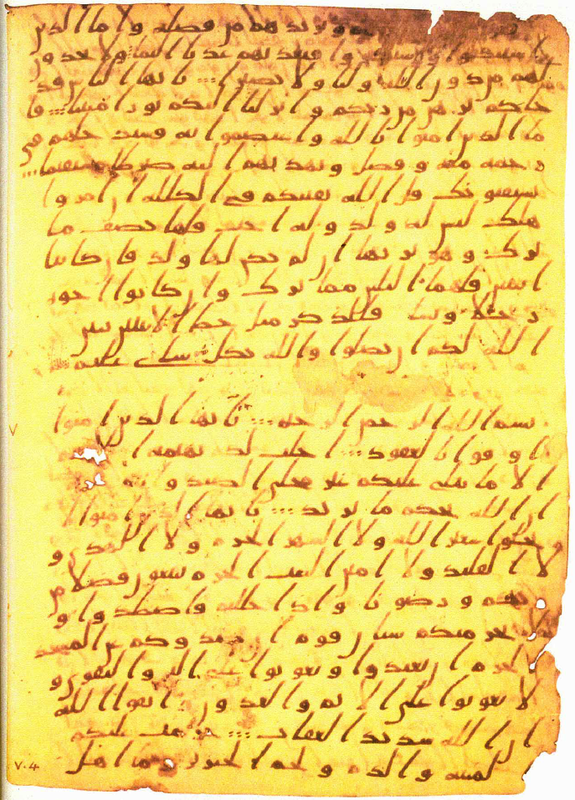 By making up a new word (unknown in Arabic but not in Syro-aramaic 32), kalâlah, and giving it the meaning of “without descendants”, the manipulators of the Koran were obeying legal requirements in matters of inheritance: to sacralize them by means of the Koran, they changed the meaning and the consonants of the word appearing in 4:12 provided the explanation to their new legal doctrine in the last verse (176)33. This is how Powers found that “verses were added, revised, and /or removed from the text” and that “the consonantal skeleton of the Qur’ân remained open and fluid for three-quarters of a century” 34. These legal issues are of little interest to us. They came late on the scene and present too little ideological significance for our study. What is of interest to us is first the fact that the recto of Folio 20 (see below) reveals too many lines, that are too wordy: 27 is about five too many. If we add the 3 excess lines and the two blank lines of Folio 20 verso, we arrive at a total of ten extra lines total for the front and back together, to which we also need to add the 6 additional lines of verse 176; in other words, a total of 16 extraneous lines. According to Powers, the copyist had planned to begin Sura 5 Al-Mâ’ida in the middle of the verso of the current Folio 20; however he was interrupted in his writing of Sura 4: this is the only acceptable explanation. But Powers reveals a more serious anomaly: the third of five codices or quires that form the manuscript of the BNF comprises only 7 Folios, when it should comprise eight. The picture he provides on p.185 is convincing: the original Folio 20 has been cut – we still can see the stub of it. As the current one, this primitive Folio 20 began with the last two words of verse 160. As for verse 171, it should be at the bottom of the recto: revealingly, it is actually the one that is so ideologically and exegetically suspicious. This is why that it is quite normal to assume that the work was interrupted at that point, precisely when the copyist was in the act of writing down the original version of Folio 20, the one which was subsequently removed. We must understand what is at stake in the current form of verse 171 and perhaps as we do so, we will we gain some insight into the missing lines that appeared on the original Folio 20. And do not say: Three (Trinity). Stop it! It is better for you. Inna-mâ God is unique deity. Purity to Him! Would He have a child (walad)? To Him all that is in heaven and on earth. And enough is God as a Protector” (Q 4:171b). The second section of this verse is an attack on the Christian faith and is addressed specifically to Christians; consequently, because of the first section Christians seem to be called as “People of the Book”. But taken in itself, this first part (Q 4:171a) constitutes a reproach to the Yahûd for not knowing “the messiah-Jesus”, and here those seem to be the only original « People of the Book » in the sense of the whole people of Moses to whom the Book was given 38. Of course, in Q 4:171a, we habitually read: “The Messiah ‘Îsa–Jesus only is the messenger of God”, which means that this sub-verse was actually intended for Christians, who believe that Jesus is more than a “messenger of God”. The proof that this is the correct “interpretation” is supposed to be the fact that in 4:171b we read : “Only God is unique deity” – and so this adverb inna-mâ seems to have had the meaning of only. But this doesn’t sound right. Three reasons point to a manipulation. “Say of God nothing but (only) the truth (lâ taqûlû ‘alâ Llah illâ l-haqq)”. Why then do we not find it in 4:171b ? Are there two ways of implying the same restriction, one time with lâ… illâ… and another with inna-mâ? Or are we faced with an intentional manipulation? “The believers are indeed (inna-mâ) brothers (or: such close brothers)!” (49:10). “If they turn away, they are indeed (or: much) in disagreement” (2:137). “Then, sin weighs indeed (or: heavily) upon those who changed it [the testament]!” (2:181). Moreover, etymologically speaking, the meaning of inna-mâ is completely unambiguous: this adverb is composed of two intensives that reinforce each other: yes, indeed 39.
thanks to the new meaning given to inna-mâ, the title of Messiah in 171a becomes (only) a negligible title, which is also crucial to anchor Muḥammad’s prophetic status, which otherwise would always remain inferior to that of the Messiah. However, the whole sub-verse 4:171b suggests that the preacher is addressing the Christian Arabs. It must be considered to be an addition – it was fabricated for a large part from passages borrowed from the rest of the text: “Purity is His! Would He have a child 40? His are all the things in heaven and on earth. And God suffices as a protector”. “Never would the Messiah deem unworthy to be a servant (‘abd) of God, nor would the angels near. Whoever disdains to serve (‘abada, adore) Him and is arrogant, He (God) will gather them all to Himself [for Judgment]” (4:172). “Inna hu illâ ‘abdun: Indeed, he [the son of Mary, v.57] is only (otherwise) a servant” (43:59). “Mâ al-Masyh ibn Maryam illâ rasulun: What is the Messiah son of Mary but (otherwise) a messenger?” (5:75). Concerning the message conveyed by verse 4:171a, all doubt is removed about what the meaning is or who the recipients are: they are the Yahûd. Verse 4:174 is also intended for them, explaining that the Messiah is the “clear light” God “has sent down to you” – i.e. to them who do not believe in him. The Messiah must be believed because he is a perfect servant of God just like the angels (in whom the Yahûd believe). This message is none other than the old Nazarene creed 41, which proclaims Jesus to be a Messiah-King-Servant, no more and no less. Another ideological (and textual) intentionality inspires the writing of the added sub-verse 4:171b 42. And yet another one, less theological than juridical in nature, underlies the adding of the final verse 4:176, as we have seen. However, two important additions that are so close, respectively in the front and the back of the actual Folio 20, represent something significant. Other manipulations took place, shown by the cutting of the primitive Folio 20, of which only the stub remains; but those manipulations consisted in expunging from the text. • the Paris BNF manuscript, which was altered in the course of its writing, seems to have become the standard for the other ancient manuscripts, even if the Folio at issue is not actually found in two of them, the British Oriental 2165 and the Samarkand manuscript. • the removal of several verses appearing on the primitive Folio 20 must be related to verse 171a and to what precedes it, given the overall harmony of the primitive sheets. Legend: The stub of the primitive Folio 20 is visible between the Folio 19 (verso) and the current Folio 20 (recto). So what can we conclude? A logical tie is lacking between verses 171a and 172, both of which concern the Messiah-Jesus – and this passage should be addressed to the Yahûd. Indeed, before verse 160, the text says that Jesus was taken up to heaven: “God raised him to Himself” (Q 4:158). Islamic traditions have preserved the memory of the typically Judeo-Nazarene proclamation that announced that Jesus would come down again from Heaven and would one day bring about the Judgment spoken of in verses 173-175. In the meantime, he is being asked to wait in Heaven 43. “Those shall be saved at the time of the Visitation but the rest shall be delivered to the sword, when the Messiah of Aaron and Israel comes, as it happened at the time of the first visitation” (CD-b 1,10). So this is all really about a second visitation. A lengthy and comprehensive explanation of the coherence of the Judeo-Nazarene doctrine would have to be made and constitute its own study 45. What should be noticed here is the wholly abnormal absence, in the Koranic text, of any allusion to the physical return of the Messiah-Jesus on the Mount of Olives (where he had ascended into heaven in the first place) – for, of course, his return on top of a minaret of the Umayyad Mosque in Damascus is a later legendary transformation. Credibly, the missing passage in Sura 4 had to do with this return down from heaven and the victory over all the armies of the earthy nations, but also with the rebuilding of the Temple. However, what was the Cube quickly built in 638 over its original location by some “Jews” allied with the Arabs 46? Fifty years later, at the time of the copying of Manuscript BNF ar.328a, that same cubic worship space was being replaced by ‘Abd al-Malik's octogon (completed after 692). The work of these copyists and its difficulties were probably closely tied to the doctrinal revisions mandated by Caliph Umayyad at the time. How many verses were in fact deleted between verses 171a and 172? Leaving aside the missing folio, Powers (p.188-190) tried to rearrange the verses simply by removing the extrinsic ending of Sura 4 (verse 176). But even so, at least 2 lines seem superfluous: Powers had to assume that some lines were long and overloaded – similarly to the beginning of the actual Folio 20. Moreover, in this case the copyist seems to have left blank an extra folio at the end of their work. But in reality we can only conclude that 41 or 42 lines of the original manuscript were deliberately left out (since we must count 22 lines per side of each folio). The copyist had begun to copy those lines on the back of the primitive Folio 20 but had stopped before getting to Folio 21 (now the current Folio 20 after the original Folio 20 was cut). Such a quantity of lines correspond well to the doctrinal content we suppose was deleted. The simultaneous confrontation of codicological studies and exegetical methods drawing support from the data provided by ideological analysis, opens a new way of conducting a kind of scholarly study that hasn’t yet revealed its rich potentialities. The Judeo-Nazarene line of research is proving to be very legitimate and productive. As far as codicology is concerned, it is quite conceivable that a careful study of the actual Paris manuscript would provide a greater understanding of the history of the text than just the (exclusive) study of photographs of it. In the meantime, we can also hope that more ancient Koranic fragments, as ancient as this one, will be discovered. and particularly the twenty-six folios of the National Library of Russia in Saint Petersburg (Marcel 18, f. 1-24 et 45-46. The curator, Olga Valentinovna Vasiljeva, finally produced some copies for us). According to Francois Deroche, the whole set counts 98 folios and represents approximately 45% of the manuscript, which should have comprised between 210 and 220 folios originally (216 logically, since the number must be divisible by eight, the number of folios needed to form a quire or codex) – cf. La vulgate ‘uthmanienne et le témoignage des premiers manuscrits, in Urvoy Marie-Thérèse, Ethique et religion au défi de l’histoire, Versailles, éditions de Paris, 2011, p.76. With regard to manuscript LNS 19 CA (5:89-100 and 5:120-6:12) in Kuwait, it visibly belongs to ms British Or.2165 (pattern, colour of the paper, diacritical dotting, etc.). 2 The Bavarian Scientific Academy owned a collection of 154 microfilms of ancient Korans. In 1944, the Academy was bombed by the Americans and everybody thought that those microfilms had been destroyed. Actually, they had been moved to a secure location by a young Orientalist, Anton Spitaler (1910-2003), who served in the Muslim troops of the Nazi regime. After the war, during his career as a professor at the University of Munich, he kept the manuscripts a secret. In 1970, Günther Lüling, a lecturer, prepared a doctoral thesis making a comparative analysis of certain passages of the Koran with some Syriac hymns: Spitaler had him discharged from the University and instead pushed for the appointment of a certain Angelika Neuwirth. The latter was made aware of the existence of the microfilms, and she received them from Spitaler in 1990, as she admitted after denying their existence for twenty years. But she still refuses to release them. 3 The much advertised Berlin project “Corpus Coranicum”, announced in 2007, seems to be A. Neuwirth’s reaction to studies based on photos of Koranic manuscripts brought back from Șan‘â’ by Gerd Puin. Cf. Higgins Andrew, The lost archive missing for a half century, a cache of photos spurs sensitive research on Islam’s holy text, in The Wall Street Journal, Saturday, January 12, 2008, page A /1-4 ; or the item of Asia Times online – Januari 15th 2008: http://atimes.com/atimes/Middle_East/JA15Ak03.html. 4 Regarding inaccurate vowelizations, see for instance Blachere Regis, Le Coran, Paris, Librairie Orientale et Américaine, 1957, p.429 (Sura Ar-Rum 30:1-3) ; Sfar Mondher, Le Coran est-il authentique ?, Paris, 2000, p.19 (about the expression “muṣadd[i or a ? ]qan lima bayna yada–”). Regarding inaccurate redotting, see for instance Munther Younes, Charging Steeds or Maidens Doing Good Deeds? : A Reinterpretation of Qur’ān 100, in Arabica 55, Leyden, Brill, dec. 2008, pp. 362–386 ; Angels, Stars, Death, the Soul, Horses, Bows – or Women? The Opening Verses of Qur’ān 79, in Reynolds Gabriel Said, (dir. ), New Perspectives on the Qur’ān: The Qur’ān in Its Historical Context 2, 2012 (proceedings of the symposium of the University Notre Dame, Indiana, 2011), London, Routledge, 2011. 5 The list of suspicious verses was established with the help of various sources (given in the notes of this article), especially in the study: The Messiah and His Prophet (Le messie et son prophète, Versailles, éditions de Paris, 2005, 1 100 pages, 1 659 footnotes). Several parts of this study and additional articles are available on the internet both in French and in English (http://rootsofislamtruehistory.com). About the heart of Sura 61, verse 6 (mentioning “aḥmad”): see Blachere Regis, Le Coran, o.c. p.593 ; Samir Khalil Samir (dir. ), Actes du 3e Congrès international d'études arabes chrétiennes, collection Paroles de l’Orient vol. XVI, Kaslik, Liban, 1990-1991, p.311-326 ; Gallez Edouard-M., Le messie et son prophète, o.c., tome II, 3.1.6.2 – 3.1.6.4 (= p.141-153 éd. 2005). On the internet: http://rootsofislamtruehistory.com/subpages/Q61-6_Did_Jesus_announce_ahmad_in_the_Koran.pdf. 6 According to the highly apologetic Islamic website islamic-awareness.org/Quran/Text/Mss/radio.html, the Șan‘a’ manuscript Dam 01-27.1 dates from before 655 AD, with a 91.8% probability. This result concerns the dating of the scriptio inferior of this palimpsest, since the visible text is obviously more recent. However, Christian Robin’s research team (CNRS Paris) had several other Șan‘a’ manuscripts also analyzed, and at times obtained clearly aberrant results, for instance when a palimpsest reached a 95% chance of dating from 430 to 499 AD. These results were communicated during the international symposium “Les origines du Coran, le Coran des origines” (Origin of the Koran, Original Koran) held at the Académie des Inscriptions et Belles-Lettres (Paris), March 3-4, 2011. 7 The books by A.-L. de Premare are well known in French; the one by C. Robinson cited by David S. Powers is: ‘Abd al-Malik, Oxford, OneWorld, 2005, p.100-104. The quotation of Powers is taken from : Muḥammad is Not the Father of Any of Your Men, Philadelphia, University of Pennsylvania Press, p.161. 8 Theodor Nöldeke asked what could have been the oral sources of Mahomet: he then envisaged the influence of a certain “Jewish” doctrine, often called “Ebionite”, which could have contributed to the birth of Islam; but this observation remains marginal, in a treatise that is on the whole uncritical (Geschichte des Qorâns, Göttingen, 3 volumes, 1860sq). Specialists of the Jewish and Christian world are the ones who really have shed light on this key aspect of historic research. They are David S. Margoliouth, who saw the importance of certain “Jews” in the emergence of Islam (The Relations between Arabs and Israelites prior to the Rise of Islam, London, 1924); Hans-Joachim Schoeps who evoked “Ebionite elements in Islam” (Theologie und Geschichte des Judenchristentums, Tübingen, Mohr, 1949, p.334-342); J.-M. Magnin, a patrologist (Notes sur l’ébionisme, éd. Proche-Orient Chrétien, 1979 – gathering five articles published in POC between 1973 and 1977); Joseph Azzi, a Lebanese Islamologist (Le prophète et le prêtre / The Prophet and the Priest, first published in Arabic in 1979); Patricia Crone and Alfred-Louis de Premare (1930 - 2006), an Islamologist with a vast biblical and parabiblical culture, to mention only the most important ones. 9 “Ebionites” is a designation sometimes used by the Greco-Latin Fathers of the Church, but not a denomination: it is a biblical adjective meaning “poor”, which the Nazarenes applied to themselves, not without a certain assertive attitude (since “God’s poor” are the world’s innocent, they have a claim to government, in the name of God). 10 The neologism “Judeo-Nazarenes” also has the advantage of reminding us of the distant Judean origin of this movement, resulting from the consequences of the first Jewish war (66-70), whereas the designation “Judeo-Christianity” has become a catch-all phrase where we find – not without some malice at times – apostolic Christianity (from which the great Eastern Church [Assyro-Chaldean] directly descends) bundled with distorted forms that are radically opposed to it (precisely like Nazareism). Post-Christian politico-military (i.e Messianistic) literature is linked to that movement. It is written in Aramaic or Hebrew, and has been the object of discussion in Le messie et son prophète, o.c., volume I. 11 These occurrences were examined for the most part in: “Gens du Livre” et Nazaréens dans le Coran : qui sont les premiers et à quel titre les seconds en font-ils partie ? in Oriens Christianus, 92, 2008, p. 219-231. The English version of the article can be found at http://rootsofislamtruehistory.com/subpages/Ahl-al-Kitab_people-of-the-book.pdf (or .htm). The comprehensive study appeared in Le messie et…, volume II, p.247-253. 12 The co-textual analysis of the occurrences of “ummah” in the Koranic text suggests that when this word isn’t used in the sense of tribe in the general and biblical sense (as in the “twelve tribes of Israël” Q 7:60), it denotes the Judeo-Nazarene sect, of which 3:113 and 7:159 offer striking examples. 13 In the « Koranic » text, when « qur’ân » designates a lectionary (according to its meaning in Syro-Aramean), it refers to the text that the Judeo-Nazarenes translated for their Arab allies, and all original occurrences mean just that (instead of a « celestial Koran »); the verses then become very clear. 14 Cf. http://rootsofislamtruehistory.com/subpages/Sura-the word_EN.pdf (or .htm). 15 Cf. Munther Younes, Charging Steeds…, o.c. 16 Cf. http://rootsofislamtruehistory.com/subpages/Coran_&_diacritism-II_EN.pdf (or .htm). 17 Arab Christians never mentioned the Holy Spirit other than with the formula ar-Rūḥ al-Qudus, that takes the article al before the substantive and is wholly biblical (rūaḥ qadeš-û, his Holy Spirit, Es 63:10.11 ; Wis 1:5 ; 9:17; Greek or Aramaic Mt 1:18.20 etc. – otherwise the meaning would change to the spirit of the Holy One). Elisabeth Puin, cf. note 19, arbitrarily suggests that the presence of the article is optional. 18 Cf. Puin Elisabeth, Ein früher Koranpalimpsest aus Șan‘â’, Teil I, in Inârâh 3, Berlin: Schiller, 2008, p.476 + Teil III, Inârâh 5, 2010, p.275. 19 We find this expression “al-Masiḥ ‘Îsâ” four times in the Koran (the title “Masiḥ” appears eleven times in all and always to refer to Jesus). 20 Before being called muslimûn (those who submit – cf. http://rootsofislamtruehistory.com/Muslim_the_Word.pdf), they were simply known as “muhâjirûn”, i.e. those who did the Hegira. 21 Cf. 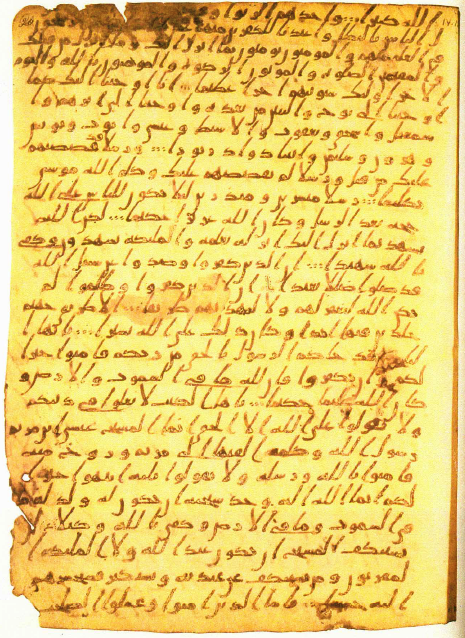 Puin Elisabeth, Ein früher Koranpalimpsest aus Șan‘â’, Teil I, in Inârâh 3, Berlin: Schiller, 2008, p. 477.485. 22 It is possible also to translate “min ‘inda Llâhi” by “from God’s house”, as in everyday speech: they “departed from your house (min ‘inda-ka)” (4:82), or simply by of, as in: this came to him just “of his own” (2:109) or “of their own” (3:16), etc. 23 In this verse Q 2:89, it is possible to apply the term of “messenger” (rasûl) to the angel Gabriel; but this can be found nowhere in the Koran. 24 In addition to the two verses Q 2:89.101, “min ‘inda Llâhi” appears in Q 2:103 ; 3:37 [for Mary]; 3:126 [concerning a victory]; 3:195 ; 3:198 ; 4:78 [concerning a reward or punishment]; 8:10 [an aid]; 24:61 [greetings]; 41:52 ; and 46:10 [a message]. To these we must add the equivalent formulas where “Llâh” is mentioned under a personal pronoun: Q 3:7 [concerning a book or message]; 5:52 [a victory or a command]; 8:32; 9:52 [a punishment]; 10,76 [the truth]; 11:28 [a message]; etc. 25 The reproaches expressed by the root kfr implicate the Yahūd and only them, as it was proven in: La racine kfr, importance et significations biblique, post-biblique et coranique, in Le texte arabe non islamique, Studia Arabica vol. XI, éditions de Paris, 2009 (colloque de Toulouse, 22-23 octobre 2007), p.67-87 – cf. rootsofislamtruehistory.com/subpages/KFR-root_from_Bible_to_Koran.htm. 26 Another verse makes use of the formula “min ‘inda Llâhi” and expressly evokes the lectionary-qur’ân then in use: “If it [this lectionary] came from another one than God, ...” (Q 4:82). 28 According to Bernard Flusin, the construction of the al-Aqșa Mosque is posterior to 710 AD – cf. L’esplanade du Temple à l’arrivée des Arabes, in Bayt al-Maqdis. ‘Abd al-Malik’s Jerusalem part 1, Oxford Studies in Islamic Art xi, Oxford Univ. Press, 1992 p.30. 29 Al-Khatib (5:228) explains that some have read the rasm ryh (without alif) in the singular (wind) and others in the plural, which clearly shows that the alif as a mark of the plural is often a diacritic addition. 30 According to Palmer’s translation. One can also cite this verse: “When Moses departed by night with his family…” (Q 28:29). 31 The recto of the Folio of the St Petersburg manuscript containing verse Q 4:171 begins with verse 170. An important part of the top right corner was rewritten in a different penmanship style and with two insignificant additions: الذي (aladi, him, the messenger) in the first line, and ما في (ma fi, what is [on earth]) in the third line. 32 Indeed, an old Aramean root, kelyla’, crown, gave the word kalalè’, which means “martyrs” in a liturgical sense – literally: those who have been crowned (in Heaven), as Christophe Luxenberg pointed out (cf. Köbert Dictionary [Vocabularium Syriacum], Rome, 1956, p.95). We are allowed to think that the person who manipulated this Koranic verse was a learned Aramaic-speaking man with an ounce of mockery: since the Caliphate demanded of him that he replace the word kallah, he “crafted” a word that already existed, right in front of the Arabs’ noses, who didn’t notice anything. 33 This case of an interpolation at the end of a Sura is far from isolated. The long final verse in Q 48:29 is another example: many clues, including doctrinal reasons, prove that verse 29 that forms the end of the current Sura 48 al-Fatḥ can be viewed as an insertion: the Sura originally stopped at verse 28; these were exposed in Le Messie et…, volume II, p. 358-368. 34 “The literary and documentary evidence examined in this monograph suggests that the consonantal skeleton of the Qur’ân remained open and fluid for three-quarters of a century between the death of the Prophet and the caliphate of ‘Abd al-Malik. The process of fixing the consonantal skeleton proceeded by trial and error. Problems were identified and solved, mistakes were made and corrected, and verses were added, revised, and /or removed from the text” (Powers David S., Muḥammad is not…, o.c., p. 227). The study of the original missing Folio 20 can be found in p.184-196. 35 Translating “lâ taġlû fi dynikum” by “commit no excess in your religion” does not make sense. As Christoph Luxenberg showed it, we should translate according to the Syriac: “do not err in your judgment”. Neudeutung der arabischen Inschrift im Felsendom zu Jerusalem, in Die dunklen Anfänge, neue Forschungen zur Entstehung und frühen Geschichte des Islam, Berlin, Hans Schiler, 2005, p.136. Everyone can verify that, in the Koran, the word “dîn” does not mean religion (conveyed instead by “millah”), but judgment, as we can see as early as verse 4 of al-Fâtiḥah: “Master of the Day of Judgment” (and not of the “Day of Religion”!). 36 In ancient Arabic as well as in Hebrew and Aramaic, the word ruḥ means both blow and spirit, but the common classical Arabic language now differentiates ruḥ (spirit) from rîḥ (blow – same root). 37 It is possible however that the original text of Q 4:171a had mentioned: So believe in God and His Messiah. This is what a 10th-century (at the latest) Syriac translation of the Koran indicates. Only a few passages were saved of the original complete work, thanks to Denys Bar Salibi (m. 1171), bishop of Amid, in his Treatise Against the Muslims (cf. Mingana Alphonse, An ancient Syriac Translation of the Kur’ân exhibiting new Verses and Variants, Manchester / London, University Press, 1925, p.4.6.27.41). This doesn't change the fundamental meaning of the verse, which is an appeal to believe in Jesus, rasûl and Messiah. 38 If we consider all the Koranic occurrences of ahl al-Kitâb, it is clear that they designate the Jews as a whole, as heir and legitimate owners of the Bible – even if it meant having to explain that some read it correctly and some didn't – cf. http://rootsofislamtruehistory.com/subpages/Ahl-al-Kitab_people-of-the-book.pdf. 39 In a book soon to be published, Christoph Luxenberg observes that the Arabic adverb ’inna + mâ corresponds exactly to the Syro-Aramaic ên + mâ , meaning: “Yes, assuredly”! This correspondence adds to the already long list established by that author (cf. Die syro-aramäische Lesart des Koran. Ein Beitrag zur Entschlüsselung der Koransprache, Berlin, Das Arabische Buch, 2000). 40 The term walad used in 4:171b falls within the context of an unfair controversy against the Christian faith. Arab Christians never said that God had a child-walad but a son-Ibn (figuratively /analogically speaking). This polemic is evoked in other Koranic passages. 41 See notes 10 and 11. 42 This intentionality is not part of what is “religiously correct” address. It probably is why, though they are very quick to imagine all sorts of manipulations in the Gospel, many exegetes fail to notice any in the Koran – cf. for example lemessieetsonprophete.com/annexes/Questions-debat.htm#RecensionGnilka. 43 This doctrine appears for example in this passage of the fourth Book of Ezra (or Esdras): “As for the lion […], this is the Messiah whom the Most High has kept back until the end of the days. He will address those rulers, taxing them openly with their sins, their crimes, and their defiance. He will bring them alive to judgment; he will convict them and then destroy them. But he will be merciful to those of my people that remain, all who have been kept safe in my land; he will set them free and give them gladness, until the final day of judgment comes, about which I told you at the beginning” (4Ezra 12,31-36). Or in that one : “The man you saw rising from the depths of the sea is he whom the Most High has held in readiness through many ages; he will himself deliver the world he has made […] When this happens, and all the signs that I have shown you come to pass, then my son will be revealed, whom you saw as a man rising from the sea” (4Ezra 13,25-32). 44 The fourth book of Ezra alludes to the 400 years of the reign of the returned Messiah after being set aside in Heaven (4 Ezra 7:28-31), which reminds one of the 40 years of life that Islamic tradition attributes to the Messiah-Jesus after he returns to this earth – after which time he dies as in 4 Ezra, and the final Judgment happens. 46 According the Chronicle of Sebêos (xxxi), the Cube was built by some “Jews”: “There the Jews built a place of worship for themselves […] But the Ishmaelites became jealous and drove them away from that place” – and they had to content themselves with a marginal place on the esplanade (cf. Macler Frédéric, Histoire d’Héraclius par l’Evêque Sebêos, Paris, 1904, p.102-103). These data are cross-referenced by two apocalypses written in the 8th century. The first one, called the Secrets of Rabbi Simon ben Yohay, gives this ex eventu prophecy: “The second king to arise in Ishmael [i.e. ‘Umar himself] will repair the breaches of the Temple” (cited by Crone and Cook, Hagarism, The Making of the Islamic World, Cambridge University Press, 1977, p.5 /note 21). The other one is an apocalypse qualified as “Judeo-Arab” by its discoverer, Israel Levi (who dates it from ca. 750). In one of the fragments, we read that Mu‘âwîyah (660-680) “restored the Temple walls”, and Israel Levi observed with some astonishment that the “Jewish” author of that document “celebrates the construction of a mosque over the location of the Temple, as if that edifice was being restored” (Une apocalypse judéo-arabe, in Revue des Etudes Juives, t.67, n° 133, 1914, p.178-182).